Malekinejad, H., Alizadeh, A., Cheraghi, H., Meshkin, S., Dardmeh, F. (2010). The Protective Effect of Liquorice Plant Extract on CCl4-Induced Hepatotoxicity in Common Carp (Cyprinus carpio). Veterinary Research Forum, 1(3), 158-164. Hassan Malekinejad; Arash Alizadeh; Hadi Cheraghi; Saeed Meshkin; Fereshteh Dardmeh. "The Protective Effect of Liquorice Plant Extract on CCl4-Induced Hepatotoxicity in Common Carp (Cyprinus carpio)". 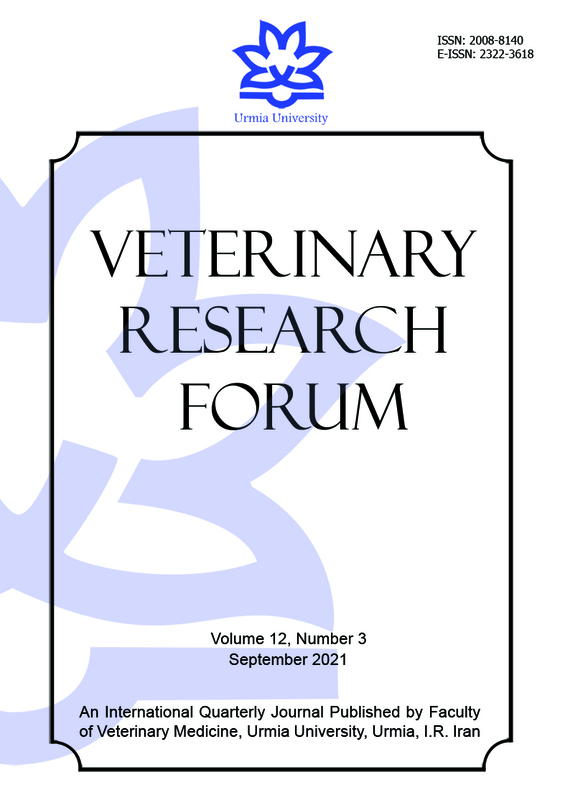 Veterinary Research Forum, 1, 3, 2010, 158-164. Malekinejad, H., Alizadeh, A., Cheraghi, H., Meshkin, S., Dardmeh, F. (2010). 'The Protective Effect of Liquorice Plant Extract on CCl4-Induced Hepatotoxicity in Common Carp (Cyprinus carpio)', Veterinary Research Forum, 1(3), pp. 158-164. Malekinejad, H., Alizadeh, A., Cheraghi, H., Meshkin, S., Dardmeh, F. The Protective Effect of Liquorice Plant Extract on CCl4-Induced Hepatotoxicity in Common Carp (Cyprinus carpio). Veterinary Research Forum, 2010; 1(3): 158-164. The protective effect of liquorice plant extract (LPE) on CCl4-induced hepatotoxicity in common carp was evaluated using fifty adult carps. The fish were cultured in a standard environment in terms of water flow rate, oxygen, pH, food and temperature. The fish were assigned into 5 groups (N = 10) as control, sham, and tests. The test groups were pre-treated for 3 h with various concentrations of LPE, 3 days before CCl4 exposure. The control and sham groups received normal saline before and after CCl4 exposure. To induce hepatotoxicity, animals in the sham and test groups were exposed against 100 μl L-1 CCl4 for 45 min. The fish in all groups 1 h after CCl4 exposure were anesthetized and the blood samples were collected. Immediately the liver specimens were dissected out and were stored in 10 % formalin for further pathological studies. Determination of serum level of ALP and SGOT revealed that acute form of CCl4 exposure elevated significantly (P < 0.05) the serum level of either tested hepatic marker enzymes. While 3 days pretreatment with LPE prevented from ALP and SGOT enhancement. The pathological evaluation revealed that the CCl4 exposure resulted in a minor pathologic manifestation such as slight congestion, which the LPE pretreated groups showed the remarkable improvement. The anti-oxidant capacity of LPE was assayed by FRAP and DPPH methods. Both provided techniques showed that LPE exerts an excellent anti-oxidant effect. This data suggest that LPE exerts protective effect against CCl4-induced hepatotoxicity. Moreover, the hepatoprotective effect of LPE may attribute to its antioxidant capacity.